The Double Stitching Option for Custom Holsters by Soteria Leather is available for almost all of the holsters Cerisse makes. About the only exceptions are the Athena IWB Holster, and the Perseus IWB Holster, as the 'wing' might not be large enough to accommodate the extra row of stitching. The picture is an example only. This item is just the OPTION for the Second Row of Stitching. 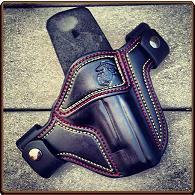 You must order the custom holster first. Note: If you want this option, you must order this separately.